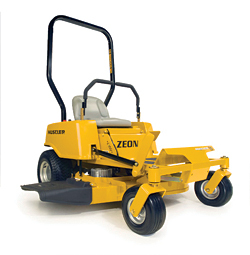 The zero-turn Zeon™ does not have belts, filters, fluids, or plugs, so it requires minimal maintenance. It is inexpensive to operate and features a welded steel deck. The mower is equipped with SmoothTrak™ steering and an automatic park-brake system. Operators can mow up to 80 minutes on one charge. It features 18-inch drive tires and 11-inch caster tires, as well as dual electric transmissions for zero-degree turning.